Kids love doughnuts. It’s a fact. And when they’re topped with shiny chocolate icing, they look and taste even better. That’s why you’ll get a big reaction when you make Alexander May’s Sponge Chocolate Doughnut appear during your show! 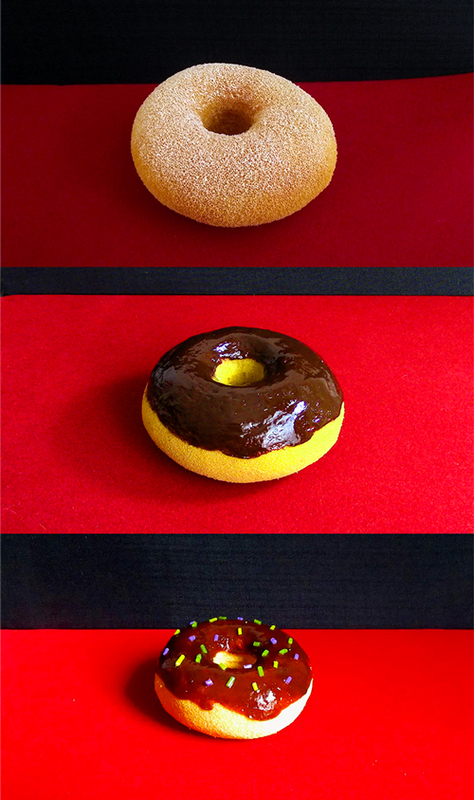 The Sponge Doughnut looks like the real deal. But it’s also very compressible. That means you can palm it or hide it in lots of different places to make it appear in a variety of ways. Check out the video and you'll see it all for yourself! Show a paper bag (maybe one from Dunkin’ Donuts) empty. Then reach inside and pull out the Sponge Doughnut. Update the old “Bake a Cupcake in Hat” routine, then you produce the Sponge Doughnut. Easy-Bake Change Bag -- Sprinkle some sugar, a small chocolate bar and some flour (use a plastic flower for the flour) into a Change Bag. Hold a birthday candle underneath for the heat. Then extract one—or a bunch—of Sponge Doughnuts. Sweet Shoe -- Take off your shoe, pull out the doughnut. Dove Pan Production – Show the pan empty. Cover it. Produce a whole bunch of donuts! What’s round like your Linking Ring? Reach through your Ring and pull out the round Sponge Doughnut! Inflate a balloon. When you pop it, the doughnut appears! Once you have the Sponge Doughnuts in your hands, we know you’ll have lots of your own ideas, too. This is a sweet prop—with lots of possibilities—especially at kids birthday parties where the Sponge Chocolate Doughnuts are a perfect fit! Oh, a final piece of advice. Don't leave them around the house. These look so realistic, someone will try to take a bite out of them! Go for the chocolate doughnut. The "powdered" version doesn't look anywhere near as good as the picture.